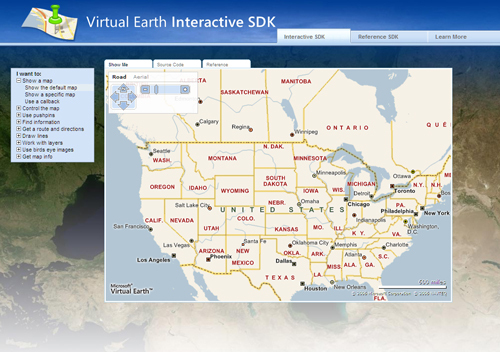 One of the coolest things I’ve seen over the weekend is this new Virtual Earth Interactive SDK. 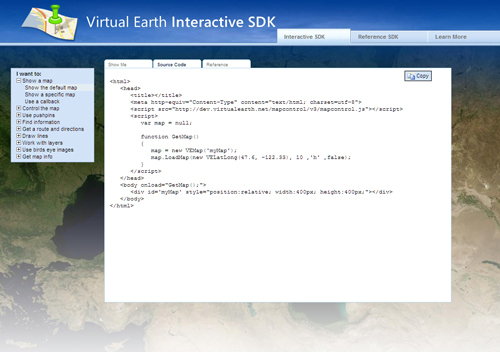 The VE Interactive SDK gives a more visual way of learning how to program the SDK. Instead of looking up the objects and methods in the online help, the VE Interactive SDK allows you to visually create your tools and then view the code to see how the control works or just copy and paste it to your own website. Plus you can also see the VE reference right there in case you want to know more about a specific function (tabs switch between “Show Me”, “Show Source” and “Reference”). I know many programmers who work better by seeing code than trying to figure out an object model (and some programmers who haven’t a clue how to even use an object model) and this Interactive SDK will be a huge help for them.